A weekend seems incomplete without an evening at QXT’s, the metropolitan area’s premier and only dedicated gothic dance club and watering hole in the heart of gritty, industrial Newark, NJ. So Friday night September 1, we stepped in early, taking advantage of the policy of free entry for ladies before 11 pm. The theme this night and every first Friday, was “Infernoir” a portmanteau of the words “Inferno” and “Noir,” and sees itself as an import of a similar club night originating in Germany. On the main floor, upholding the standard, were DJs Damian Plague and DJ Ash who motivated dancers with some synthwave as well as beloved standards from the Sisters, Wolfsheim and Siouxsie and the Banshees. For atmosphere, the ultra horrific gore-fest, the original “Hellraiser” movie, was showing on the main floor big screen and on the various monitors around the bar. We also popped downstairs to the Crypt which was just opening up, and were soon tempted over to Area 51, the other basement hangout, where DJ Mykill Hrunka’s heavy-duty industrial mix encouraged us to briefly punish the pavement before calling it an early night and heading home to prepare for the next day’s adventure. In keeping with the tradition of holding this event on those Sunday nights which precede Monday legal holidays, September 3 marked another iteration of the Redrum Ball. Impresario and host Sir William Welles dedicated it with the theme “Grindhouse,” referring to the cult interest in exploitation style, low budget horror movies, popular among denizens of the dark-scene underground culture. The DJ booth is perched way up in a far corner overlooking the dance floor, where celebrity deejays from the Goth scene, Sean Templar, Erik Aengel and Matt V Christ carried out their duties, still accessible to requests. Celebrity guest host Colin Cunningham, current star of the Syfy Channel’s “Blood Drive” series opened the event and, along with Sir William made comments, ran raffles and introduced exotic dancer Cassandra Rosebeetle who performed a striptease while decorously applying theatrical blood to her lovely and mostly exposed physique. Grindhouse favorite “Evil Dead” was projected onto a wall adjacent to the dance floor. A pull down screen was present, but mercifully it was left retracted, so the most disturbingly gory scenes were muted by the stone, brick and peeling plaster wall on which the images were cast. 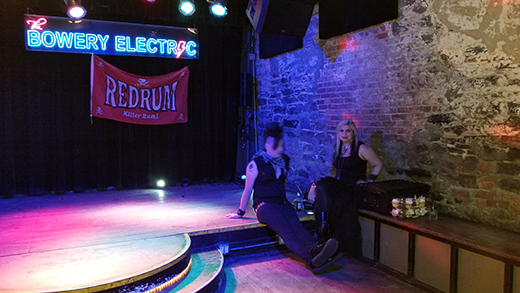 There were raffle drawings and giveaways of posters and tee-shirts and – most notably – a $200 certificate for merchandise at Gothic Renaissance the famed costume, clothing and accessories emporium. Makeup artist Joseph Drobezko made an appearance and ArchAngel came late to spin. 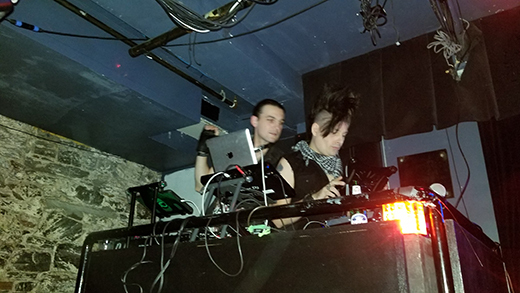 The deejays did admirably playing the likes of the Cure ‘s “A Forest,” Ministry’s “Revenge,” London After Midnight’s “Kiss” and “A Day” by Clan of Xymox, among other favs. Just before the band took the stage – while the packed room was still dark – the faux ominous beat of Screamin’ Jay Hawkins’ “I Put a Spell On You” (1956) filled the room and his operatic baritone served as powerful intro to what was to follow. Bright and multicolored lights came up and Social D took the stage like a musical riot with the jubilant “Still Alive” off the most recent (2011) album, “Hard Times and Nursery Rhymes.” The sobering “99 to Life” confessional from “Somewhere Between Heaven and Hell” (1992) was next, then back to “Hard Times” for “Gimme the Sweet and Lowdown” and “California Hustle and Flow.” “King of Fools” and “Dear Lover” followed. The set closely followed the recent performances earlier in the tour, hitting on “White Light, White Heat, White Trash,” “Mommy’s Little Monster” (the album, not the song) and the eponymous first album, with the iconic “Ball and Chain,” which seems to be about alcoholism, not drugs. A bluesy, instrumental interlude followed, then “Another State of Mind,” the title track for the motion picture documentary on the early 80s punk scene. 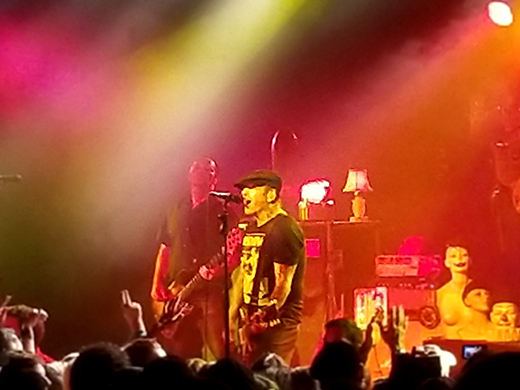 At this point, Mike Ness made reference to his band’s tradition for honoring and covering the great legends of rock and country music– what he calls “roots music.” In keeping with that he announced the next piece, ”Hope Dies hard,” a truly magnificent and emotionally stirring masterpiece by his guitarist, Jonny “2-Bags” Wickersham. Ness spoke about the issue of painful life experiences by way of introduction to “Scars,” an emotionally-wrenching song celebrating – rather than complaining about – a hard early life. Ness’ guitar skills were on display in this performance. After a brief intermission Social D returned with four encores including “Angel Wings,” “Misery Loves Company” from his solo repertoire, and “Story of My Life.” Ness invited a bunch of kids, from 5 to 11 years on stage and conducted brief but heart-warming interviews with them, at the same time admonishing them to stick to their studies even if they had intentions to follow in his footsteps to enter the field of entertainment. He faked asking for requests for the last, closing number, but then pretended he couldn’t understand the shouted suggestions. It was a foregone conclusion that he would close with “Ring of Fire,” the Johnny Cash hit written by June Carter Cash and Merle Kilgore, as he has with all recent performances on this tour. Thus ended an hour-and-a-three-quarter show in front of a sold-out audience. Ness mocked the idea behind Prohibition and he criticized the current social atmosphere to suppress Freedom of Speech, but when one or two members of the audience began to shout “F— Trump!” Ness found that to be off-message and embarrassing. He didn’t seem to like the response, so he dropped the topic and said we weren’t here to get into that, quickly returning to the music. Impresario Jet Berelson and his online community of Gothic-industrial culture, Vampire Freaks, hosted a spectacular edition of, “Cybertron” at the Gramercy Theater, presenting four bands, including international superstars, Stabbing Westward, followed by a club night of dance, late Saturday night into Sunday morning. 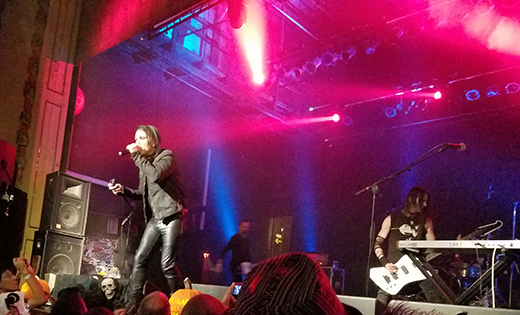 Headlining the show were industrial rockers, Stabbing Westward, continuing to celebrate their 30th anniversary as a band and their second year since reunion. The first of 3 opening bands, Blk Emoji also proved to be an eye (and ear) opening act, performing an utterly superb set of frantic, alternative rock in a style reminiscent of 90s favorites, Living Color, but with elements and flourishes that were quite uniquely their own. Departing from their outstanding set of original music, Blk Emoji applied their considerable creativity and musicianship to a trippy cover of the Donna Summer “I Feel Love,” highlighting their mastery of rhythm and powerful vocals, ending it in an orgasmic finale. 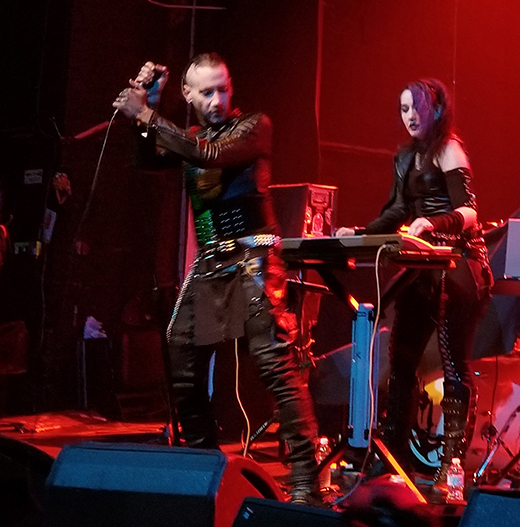 Next up, rivet-head duo Xentrifuge captivated the audience with electro-industrial, mechanized tempos, hard-edge techno and harsh, desperate vocals, demonstrating that two people with advanced technology could produce as much sound as a Civil War artillery field. 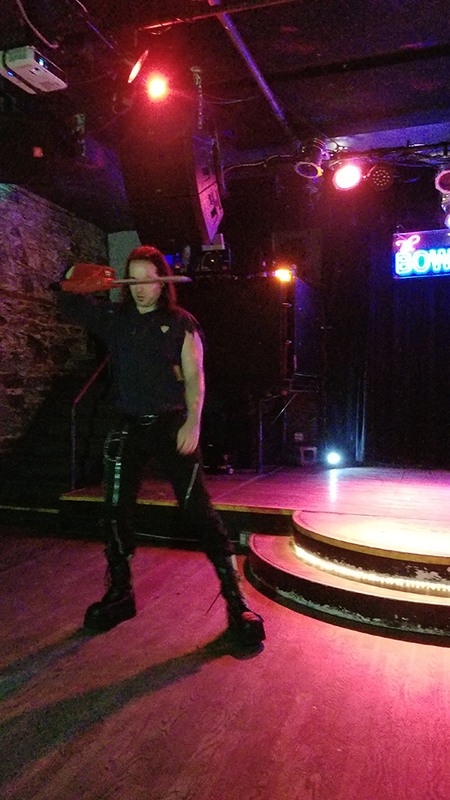 Between acts, DJs V Christ and Xris Smack kept the mood going with appropriate selections from Skinny Puppy, Ministry and NIN. Local New York quintet, Panzie opened with a an animated video entitled “Clowns,” then took the stage and combined theatrical elements suggestive of Manson (white-face jester masks, costumes, etc.) with, ultra-conventional, hair-band-style 70s, heavy metal along the lines of AC/DC. 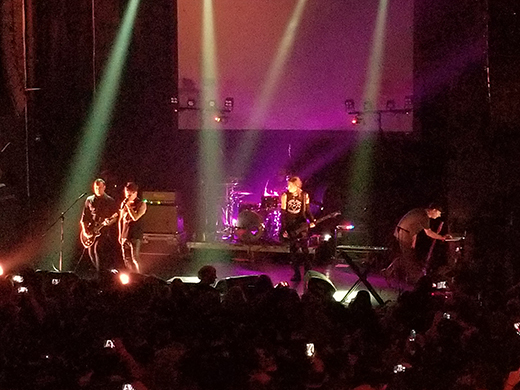 Stabbing Westward’s act opened with the critique of drug culture, “Drugstore” in which the question is posed, “How can everything be justified by you?” “Falls Apart” followed in which the words “whither, blister, burn and peel,” are sung, echoing the title of the 1995 album from which it comes. 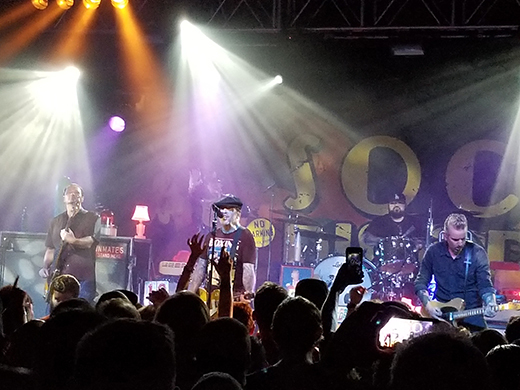 The third song, “So Far Away” complained about a relationship emotional distance. Chris Hall addressed the audience in a joking fashion, mock-threatening to end the show there, but immediately the familiar synthetic introduction to mega-hit “Save Yourself” filled the air which brought much of the crowd to their feet. When it concluded, it closed out the regular, hour-long set. After a brief intermission, the band came out for two more, the relatively mellow “Waking Up Besides You” and the raucous, hard rock anthem, “Shame.” Stabbing Westward should patent their highly effective, ultra-satisfying formula for song structure, employing just the right amounts of anger, desperation, unusual guitar voices, minor key melodies and intermittent bursts of industrial-strength sound that explodes out between intervals of tension and restrained menace. Following the show, the club night Cybertron turned the Gramercy into a dance scene with the band remaining to hang out with the crowd and music provided by the select group of top deejays. This 10-track album represents a new project by Eric Sochocki whose eclectic talent is reflected in superb recording studio wizardry as well as strong vocal style and compositional mastery. Synthetic appeggios form the basis of these SynthWave compositions and serve to both unify and at the same time diversify the work as a whole. Sochocki’s vocal styles vary from emotionless narrative to desperate to plaintive. Electronic instrumental accompaniment here is best described as compelling melody layered into rhythms of complex and hypnotic electronica that never repeats itself. Most, but not all tracks gallop along at a brisk pace. Some intros are prolonged on a number of tracks, and on the fifth track – a dark, mesmerizing and mechanistic symphony – there are no vocals at all. The eighth track, slows down the otherwise rapidly paced tempo with trippy vocals and ethereal accompaniment. The ninth track sounds like a full, electronic symphony orchestra, and the tenth is a soft and wistful ballad. Rather than describe each of these 10 tracks separately, it serves this review better to report that there is a consistent level of satisfying melody wedded to strata of complex and coordinated electronic beats suitable for either industrial dance or focused listening. 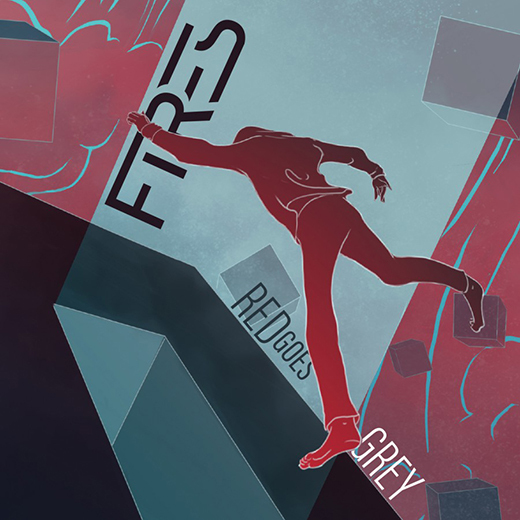 This is the fifth album by these veteran British rockers fronted by vocalist Rou Reynolds who describes himself as agitated and overwrought by current world events. Indeed, Reynolds uses this record as a vehicle for leftist, progressive politics as an antidote to the “neoliberal” ideology of individualism and capitalism that has him so despondent. The bands abilities with complex, original and highly accomplished music certainly serves Reynolds well, whether he is expressing desperation or resolve. The recording opens with an ethereal prelude featuring echoic bells and chimes, lasting 50 seconds. With the ten tracks that follow, the music becomes complex, astoundingly creative and to a great extent raucous. Rock idioms compete with choral anthems. Delicate odes accompanied by simple percussion express a depressed view of the current situation, but tumultuous choral anthems serve as a counterpoint emphasizing “light-at-the-end-of-the-tunnel” optimism with defiant lyrics and operatic vocals. The Polyphonic Spree at its most elated – or perhaps Queen serve as a good comparison, but there also tracks that incorporate hip hop-like runs of British rap to articulate the exact ideas being expressed. There’s a real lot of music going on in this album. One might even say within each of these tracks. For a band of former punk rockers it is startling to hear the well-arranged orchestral and choral elements that pervade many tracks. 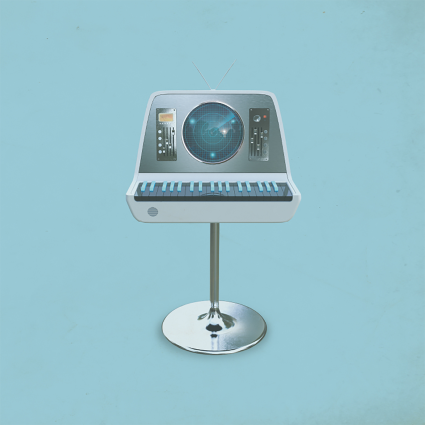 And on a few tracks – quiet and pensive, Reynolds sounds more like a counselor offering sympathy and encouragement to the listener as well as himself. This is not guitar-driven music, but uses the guitar when appropriate for poppy, rapidly-paced anthems like the leftist-progressive ode “Take My Country Back.” Synthetic instruments and rhythms prevail. As one goes through this album, one never knows what voice Reynolds is going to use next.